Charolais sold to a top price of 6,000gns with a bull clearance rate of 70 per cent at the official breed Society sale at Welshpool. The sale topper came from the Midas dispersal sale for Roger, Cath and Drew Coppinger, Edstaston, Shropshire. Midas Cath by the 15,000gns Burradon Talisman sold with a five month old heifer calf by Alwent Goldbar, to W.J. Lewis, Brecon, Powys. The Coppingers sold three more cow and calf outfits all with calves by Goldbar. The Dingle Hofmeister daughter Midas Hilda, and nine month old bull calf Midas Luke, went to Andrew Sellick, Knutsford, Cheshire at 3,600gns. At the same price was Midas Fifi, by Goldies Unbeatable, and which sold to G.R. Gould, Minehead, Somerset. Its eight 8 month old daughter went home with V.A.S. Corbett, Knighton, Powys. Another outfit made a total of 3,500gns. H.P. Thomas, Brecon, Powys bought Midas Fantastic, by Mowbraypark Paramount, while its nine month old bull calf was bought by H.M. Griffiths, Felinfach, Lampeter. The Mortimers Farm, Eastleigh, Hampshire sold cows and calves to a top price 3,200gns for Mortimers Hologram and its nine month old bull calf by the home-bred Mortimers Invincible. Buyers were J.T. and A.W. Davies, Llangedwyn, Shropshire. Two more outfits from the Mortimers made 3,050gns and 2,800gns respectively including a Seawell Icon daughter and 11 month old heifer calf to M.A. Swistun, Gower, Swansea. Then, G.R. 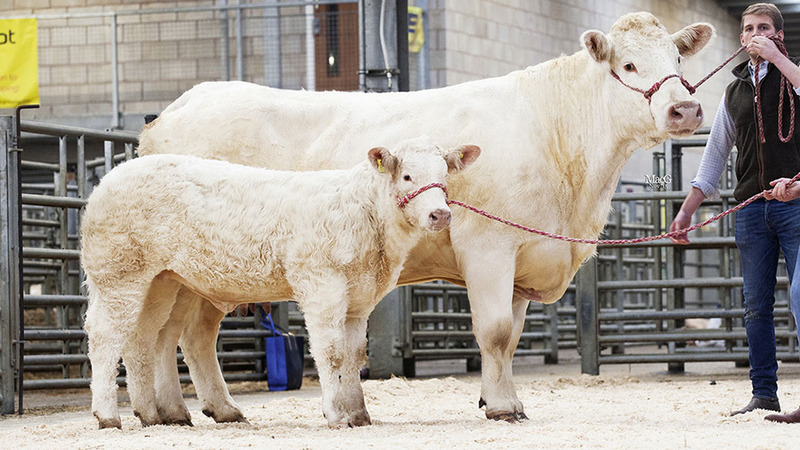 Gould, Minehead, Somerset took home a daughter of the 12,000gns Cleffany Spitfire, and six month old bull calf. In the female collective section G.M. Jones, Bala, Gwynedd took highest bid of 4,000gns from D.H. Jones, Ceredigion for an in-calf heifer, Esgob Ivonne, by the 26,000gns Anside Excalibur. Rachel Dawson, Newton Burgoland, Leicestershire purchased the 30,000gns Balmyle Bollinger daughter Cloybank Inlove from R.M. and G. Hughes, Owestry, for 3,000gns. Also in the collective sale and selling at 4,400gns, was the 15 month old bull Sarkley Jinsky from E.H. Pennie and Son, Montgomery which sold to J.M. and B.J. Langford and Son, Newtown, Powys. Four bulls sold for 4,200gns - a Blelack Digger son from J.A.W. Rees, Lanidloes, Powys was bought A.S.L. Evans, Aberystwyth, Dyfed. G.G. Morris, Llanstephan, Carmarthenshire, sold Cargriff Jupline to R., C.W. and R.W. Jones, Llanbedrop, Gwynedd, and a 17 month old Digger son, from F., J. and E.C. Andrews, Holmfirth, sold to H.E. Williams and Son, Craven Arms. Accounting for the fourth were A.G. and E.L. Jones, Llangwm, Corwen who bought Dooley Jemphasis from David Thornley, Swadlincote, Derbyshire. Averages: 26 bulls £3,436; 7 heifers £2,445. Midas dispersal - 5 cows and calves £3,969; 7 heifers £1,694. Mortimers draft - 3 cows and calves £3167.50. Next Article Video: Trimming your way to success - Are you prepared?